The quantum cascade laser (QCL) is a versatile and powerful light source which has been applied to many applications, including as a light source for mid-IR spectroscopy and as both Fabry-Perot and distributed feedback (DFB) sources for communications. A 'waterfall" of current exciting emission in the layered heterostructure. The quantum cascade laser is a quantum engineered device that relies on electronic "transitions between quantised conduction band excited states (intersubband transitions) of double quantum wells and on electron resonant tunneling as the pumping mechanism." These devices represent a new type of engineered multilayer structures composed of different compositions of InAlGaAs materials, where layers of quantum wells and barriers alternate. The basic concept was first proposed by Rudolf Kazarinov and Robert Suris in 1971, however the first realization was in 1994. 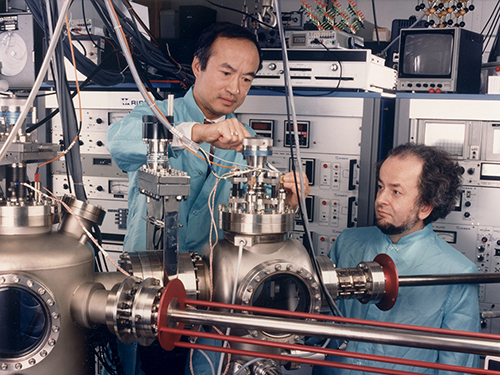 Federico Capasso and Alfred Cho were the first to sucessfully produce a quantum cascade laser at Bell Labs in 1994 and quickly adapted the laser to several applications. Researchers have subsequently produced many variations on the original design to achieve different performance characteristics. The quantum-cascade laser's unique properties -- especially its power, tuning range and ability to work pulsed at room temperature -- make it ideal for the remote sensing of gases in the atmosphere. Gases and vapors have characteristic chemical absorption "fingerprints," unique to their chemical structures. If a quantum-cascade laser is aimed above a smokestack, the laser's wavelength can be tuned to match a "fingerprint" wavelength in the air above the smokestack. Based on the fingerprint, it can then be determined if a certain pollutant is being emitted. 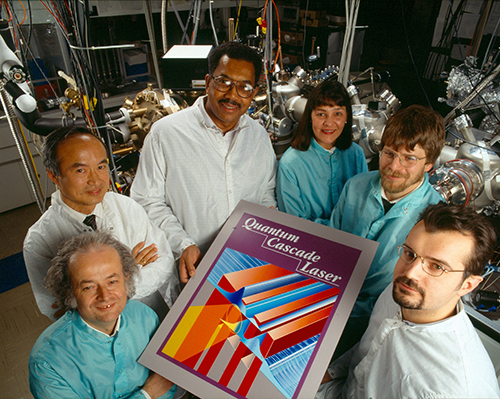 The QC laser is widely used as a source of radiation for chemical sensing and spectroscopy. Common commercial applications of QC lasers include trace gas analysis, medical diagnostics, and pollution monitoring. December 2015, the American Academy of Arts and Sciences recognized Federico Capasso and Alfred Cho for their contributions to the field of laser technology and awarded them the Rumford Prize. The Rumford Prize, one of the oldest scientific prizes in the United States, recognizes contributions to the fields of heat and light. Federico Capasso is faculty member of Harvard University, which he joined in 2003 after 27 years at Bell Labs where he was Member of Technical Staff, Department Head and Vice President for Physical Research. He is a member of the American Academy of Arts and Sciences, National Academy of Sciences, the National Academy of Engineering, the Academia Europaea and a foreign member of the Accademia dei Lincei (Lincean Academy). He has received numerous awards recognizing his achievements in nanoscale science and technology, which include the IEEE David Sarnoff Award in Electronics (1991), the Materials Research Society Medal (1995), the Wetherill Medal of the Franklin Institute (1997), the Rank Prize in Optoelectronics (1998), the Robert Wood Prize of the Optical Society of America (2001), the American Physical Society’s Arthur Schawlow Prize in Laser Science (2004), the IEEE Edison Medal (2004), the King Faisal International Prize for Science (2005), the Berthold Leibinger Zukunft Prize (2010), the Jan Czochralski Award for lifetime achievements in Materials Science (2011), the European Physical Society's Prize for Applied Aspects of Quantum Electronics and Optics (2013), and the SPIE Gold Medal (2013). He has authored hundreds of papers and holds 66 US patents. Alfred Y. Cho joined Bell Labs in 1968. He is a member of many honorary societies, including the American Academy of Arts and Sciences, the National Academy of Sciences, the National Academy of Engineering, the Academia Sinica, the Third World Academy of Sciences, and a foreign member of the Chinese Academy of Sciences. He has received numerous awards recognizing his contributions to science and technology, including the American Physical Society International Prize for New Materials (1982), the Solid State Science and Technology Medal of the Electrochemical Society (1987), the Gaede-Langmuir Award of the American Vacuum Society (1988), the Industrial Research Institute Achievement Award of the Industrial Research Institute, Inc. (1988), the World Materials Congress Award of ASM International (1988), the New Jersey Governor's Thomas Alva Edison Science Award (1990), the National Medal of Science (1993), the IEEE Medal of Honor (1994), the Materials Research Society Von Hippel Award (1994), the Elliott Cresson Medal of the Franklin Institute (1995), the Computer and Communications (C&C) Prize of the C&C Foundation, Japan (1995), the New Jersey Inventors Hall of Fame (1997), the Willis E. Lamb Medal for Laser Physics (2000), the National Medal of Technology and Innovation (2005), and the first international nanotechnology prize, RUSSNANO Prize, Russia (2009). He was inducted into the U.S. National Inventors Hall of Fame in 2009.